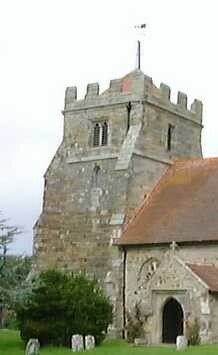 The Bells are rung before each service by a small but very keen and regular group of Bell-ringers. They practice most Saturday mornings, starting at about 10 o'clock. The tower is supported on the west side by deep diagonal buttresses and has a staircase turret at the north-west corner. There are gargoyles at each corner and a sundial is attached to the south-east buttress. The weather vane is said to be a copy of one dated 1777 which was blown down in 1895. Outside the west door is a stone slab with a Latin inscription in memory of the wife and son of Thomas Bowers, who was Vicar of Hooe from 1687 to 1708. There are five bells. 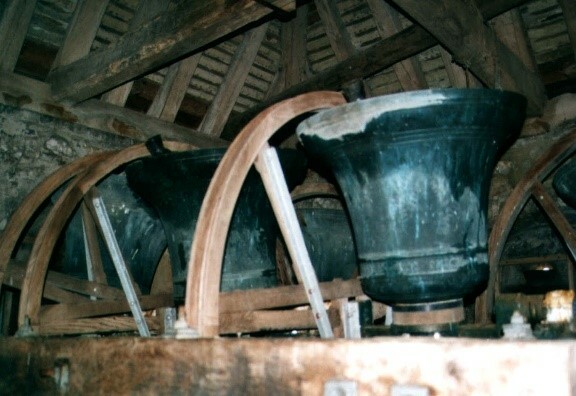 In 1724 there were four and when Sir William Burrell saw the church in 1781 the tenor bell was cracked. In 1789 the bells were restored, recast and formed into a ring of five by William and Thomas Mears. They were rehung in 1899 by Mears and Stainbank. They were restored and rehung in 1993 using cast iron headstocks manufactured by Eayre & Smith Limited.